Second album titled “Ti kala to leei t’aidoni” for SMYRNA orchestra released by CosmosArte. 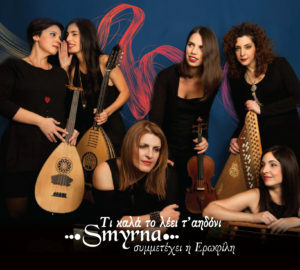 The female orchestra of traditional music SMYRNA, seven years after its first appearance in the Greek music scene, adds to her collection a new album with the most popular and discography scarce songs from all over Greece. Songs of unique sensitivity like “Ti kala to leei t’aidoni” and “Militsa” from Thrace, “Koita me glykia mou agapi” from Drama and “Ah xthes to vrady” , “Xorevis xaidemeni mou” from M.Asia meet each other harmoniously with “Triantafyllia” from Macedonia , “Trava spaggo” of Dimitris Semsis, the famous island dance songs of Giorgos Konitopoulos “Vegera” and “Tha paro volta ta vouna“, in a true celebration of the present and vivid Greek tradition. Special place in the cd has the great songwriter Vaso Allagianni that meets with SMYRNA orchestra and Εrofili in a promising and absolutely current song-message titled “Synantisa tin anoixi” with lyrics of Alexandros Stefopoulos. Instrumental tunes (“Raikos” from Macedonia,”Selfo” from Epirus” and “Skopos tou Prasinou” from Cyclades) complement the cd.